Native to stony areas in the Mediterranean region and southwest Asia, milk thistle is also known as Mary thistle, as the white veins on its leaves are reputedly due to splashes of the Virgin Mary’s milk falling on them while she fed the Christ child. Although it encourages milk flow, it is probably now better known for its liver-protective qualities. Milk Thistle seeds protect the liver from toxic substances and stimulates the regeneration of the liver tissue in recuperation from liver disease and alcoholism. The herb is especially recommended for people living in or working around environmental toxicity, including industrial pollution, radiation, hydrocarbon fumes and bad weather. Take 20–50 drops of the seed tincture with a little water 3 times daily for liver and gall bladder problems, or to stimulate the digestion. Take up to 1 tsp (5ml) daily in water as a preventative if you have a history of gallstones or liver disease. Treatment of gallstones requires professional advice. The seeds can be ground in an electric coffee grinder or similar and taken plain, mixed into yogurt or sprinkled onto cereal. The seeds should be stored whole and grounded when needed to avoid the seeds going rancid. The dosage is 1 tablespoonful (8 g) twice a day, which is equivalent to 400 mg of pure silymarin. 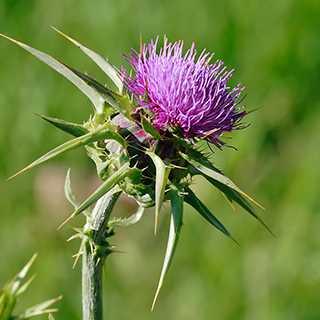 Regular use of milk thistle capsules may help in the treatment of liver diseases. Drink 1–2 cups (1 tsp leaves per cup boiling water) daily to stimulate milk production when breastfeeding. The infusion can be used to stimulate a sluggish digestion. Alternatively, drink 1 cup (1 tsp seeds per cup boiling water) 3 times daily for liver disorders, including infections. Prefers full sun in poor to moderately fertile soil that is well drained and neutral to alkaline. Sow seeds where you want to grow them in spring for annual growth or in late summer or early autumn for flowers the following year. Thin to at least 18in (45cm) between plants. Collect the seeds in late summer; other parts of the plant can be gathered for culinary use during the summer.